I've been waiting on a couple of things from eBay, and finally something fun arrived today. 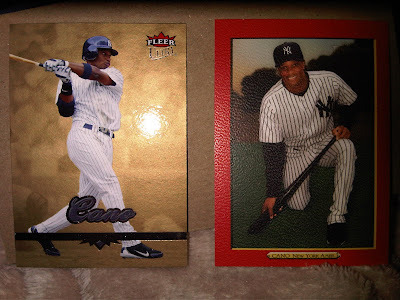 I got these 2 Robinson Cano cards for $3.10 delivered, the gold medallion card was a buck and the Turkey Red red was a buck ten. Though the shipping was only a dollar it was a little annoying to open this one for only one reason- the cards were halfway out of the penny sleeves when I opened it. I anticipated the shipping to be in a white envelope and I was fine with it for a dollar, but I expected the cards to be a little better protected. 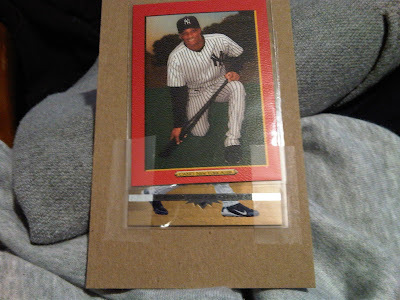 They were between 2 pieces of thin cardboard, each in a penny sleeve which was taped from the bottom to the cardboard. 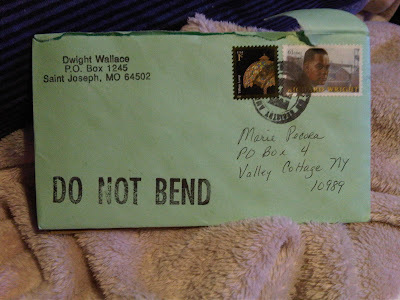 At least the envelope wasn't white. Sounds like its time to follow up on that claim.